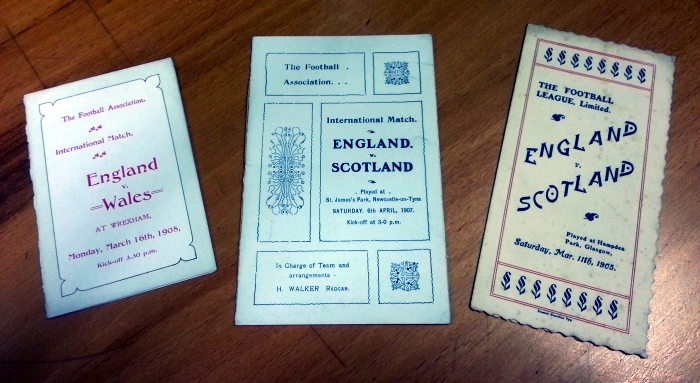 Here we have three player schedules from the early 1900′s sent to Harold Hardman of Everton FC prior to his involvement with the England side. Hardman scored 25 goals in 130 appearances for Everton between 1903 and 1908, before moving on to Bradford and Stoke later in his career. He was a member of the 1908 British side which won the Olympic gold medal, and made 4 appearances for England, scoring 1 goal. England won the 1908 game against Wales 7 – 1, the 1907 game against Scotland was a 1 – 1 draw. The 1905 game is a bit more awkward to pin point, as we can’t find the score listed anywhere – only a 1 – 0 England home win on 1st April later that same year.